This pic was mostly unintentional. Really. But I thought it had an album cover feel. What kind of music would buns make? Probably weepy. I'm thinking mopey emo crapola. Think Wilco with high-pitched voices. Ok, I'm totally dating myself; do they still call them album covers? I don't even know. Cover art. Oh yeah. Though really, I don't really mind dating myself. I miss the underground 80's. Chibi says "Decemberunderground" by AFI, or JUNE but she says that's a japanese band. Mr. Greenjeans says: "Eco and the Bunnyman"
Nee says Blue October would have cover art like that. 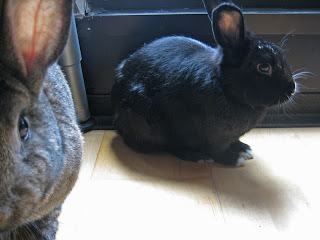 (But they're kind of EMO), Depeche Mode, or Switchfoot, or SongsToWearPantsTo has a bunny song. Me? I vote for Simon and Garfunkle. My buns would be singing country. Sometimes sad, sometimes uplifting. We named Clint after Clint Black after all! And OMG Ilex, I listened to all that punk stuff in high school. I have a girlfriend who still loves Peter Murphy (Bauhaus). There's nothing wrong with dating yourself, but it's also fun to date other people. That way there can be a designated driver. Speaking of cover art, and taking it back to the 60s, there's an amazing DVD regarding a little known (outside of the industry) photographer how captured the images on some of the most iconic albums of that day - Crosby Stills and Nash, Doors, Hendrix, etc. His name is Henry Diltz and there was a gallery showing of his work near Santa Barbara a couple of years ago. The DVD tells the back-stories of many of the covers and has some cool Super-8 footage from "the day." Here's a bit of info about the DVD at Amazon.